Combine the salt, garlic and pepper flakes in a small dish then rub all over the roast. Place the roast in your crock pot. In another bowl combine the chicken broth and vinegar, then pour over the roast. Drizzle the honey over the roast. Cook on High for 4-6 hours or until roast is tender. 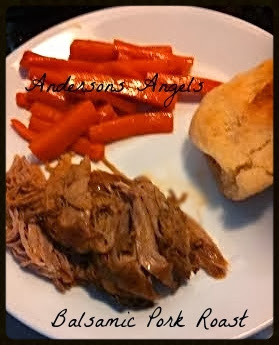 I served my roast with Honey Glazed Carrots and my Homemade Rolls. I love the combo of balsamic vinegar and honey! Thanks for sharing another great recipe with Delicious Dish Tuesday.